tldr: Neatline makes it possible to create separate themes for individual exhibits, which is useful if you want to host a collection of self-contained Neatline projects on a single site. To get started, fork the exhibit starter theme, which abstracts out the style, layout, and UX of the Project Gemini over Baja California exhibit. One of the coolest but most under-documented features in Neatline is the ability to create separate themes for each individual exhibit. Since Neatline exhibits are just one particular type of “view” inside of Omeka, it’s always been possible to customize the styling and layout at the level of the Omeka theme. Changes the the Omeka theme, though, propagate to all the exhibits on the site. In many cases, this is ideal - if you have a collection of closely-related Neatline projects, all part of the same thematic umbrella, it makes sense that they should all look more or less the same. For examples of this, check out Jeremy’s beautiful Astrolabe and Neatscape themes for Omeka, which were designed with Neatline projects in mind. 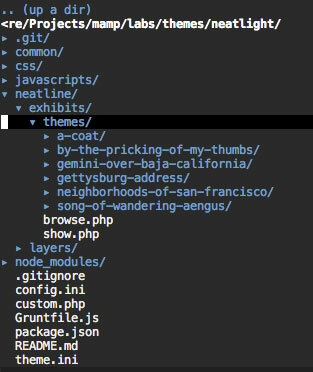 I’ve held off on documenting this publicly because I wanted to be sure that the file structure and Javacsript APIs used in the themes worked well at scale - but at this point it’s all pretty battle tested, and I’m curious to see what other folks can come up with! 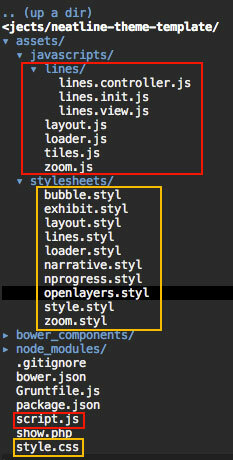 Neatline themes consist of just four files: style.css, script.js, show.php, and item.php. Use style.css to add custom CSS to the exhibit. Neatline loads this as the last stylesheet on the page, after the Omeka CSS and after the CSS provided by the Neatline core (which, if you want, can be omitted from the page by providing a custom show.php template - see below). 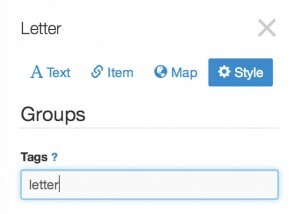 style.css can be anything from a handful of simple rules to change fonts or colors up to a complete redesign of the page. The cool thing about this architecture is that snippets of code in the script.js file can hook directly into this messaging system and interact with Neatline just as if they were included in the core codebase - Neatline literally won’t know the difference. There’s really no limit to what you could do here - the entire Neatline editing environment, for instance, is implemented as a single module (containing lots and lots of nested sub-modules), and could theoretically be grafted onto Neatline completely inside of an exhibit theme. This makes it possible to wrap up a Neatline exhibit in pretty much any kind of interface without having to modify the internals. For an example of a fully-fledged module, which follows the file layout conventions of the Neatline core, take a look at the Lines module in the Gemini theme, which intercepts events broadcast by NeatlineText and draws the little yellow lines between the text and the map. And Neatline will automatically use that template instead of the default. What if you need different templates for different items, though? For example, imagine that you actually have two types of items in the exhibit - the images, which just need the title and thumbnail, but also a set of letters, which are structured as “Text” type items with the transcriptions of the documents entered into the “Text” field. So, how to display both types of items in the exhibit, without resorting to a weird, Frankenstein template that accommodates both? Neatline will automatically use the tag-specific templates for any records tagged with image or letter, and fall back to the unadorned item.php template for records that aren’t tagged. To make it easy to get started, I’ve created a little starter theme, based on the theme used for the Project Gemini over Baja California project, with all of the configuration and file structure in place to build out themes for exhibits that use the NeatlineText extension. This includes all of the layout, styling, and UX interactions from the Gemini project, like the little yellow lines that wire up the text with the map. 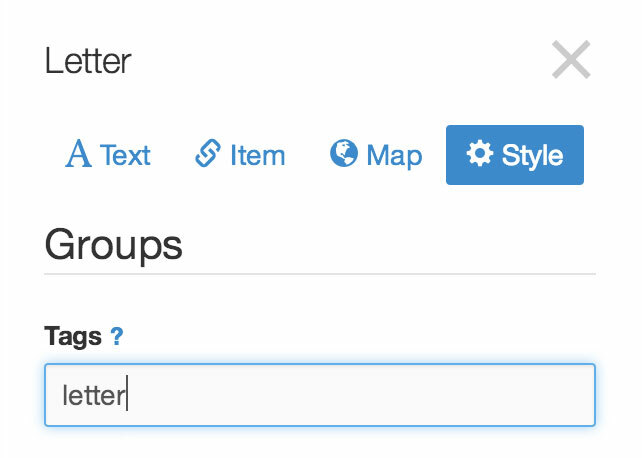 Just fork the repo, clone it into your Omeka theme, and theme into the sunset! Cite this post: David McClure. “Creating themes for individual Neatline exhibits”. Published April 01, 2014. https://scholarslab.lib.virginia.edu/blog/theming-neatline-exhibits/. Accessed on .